The three-row Traverse offers a lot to growing and busy families. On the exterior, it holds a good design with a premium-styled look. Inside it’s roomy and comfortable with a variety of cargo and passenger configurations that can be swapped around as needed. More infotainment as standard and a long list of available safety equipment are also high points. The interior of the 2018 Traverse is very well done with an eye toward a premium appeal and family ergonomics. The driver’s position features excellent controls layout, and a smart mix of comfort and road-readiness. The front passenger enjoys plentiful legroom and lots of visibility to the front and sides. In the second row, seating is very comfortable, especially if the optional captain’s chairs (standard on some trims) are used instead of the bench. This gives seating similar to the front for the second-row passengers, as well as a nice walk-through for getting to the third row. The second-row bench folds forward and slightly up to give easier access to the third row if the captain’s chairs aren’t opted for. The third row in the 2018 Chevrolet Traverse is one of the best we’ve been in. With the exception of the premium-level Buick Enclave, which the Traverse shares much in common with, and the Ford Flex, we’ve never seen an adult-friendly third row like the new Traverse’s. Thigh support is unusually good for a third row and headroom is phenomenal. 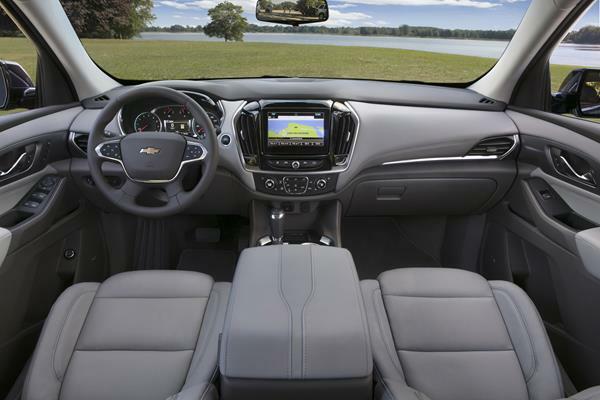 In addition, the new Traverse’s design added three inches of legroom to the third row and almost that much to the second row. This may be the roomiest midsize three-row in the class. Some of the extra room in the second and third rows came thanks to a reduction in cargo space behind them. Yet most won’t notice, as the cargo space is still better than that found in most rivals. Especially when all rows are folded and maximum cargo allowance is needed. 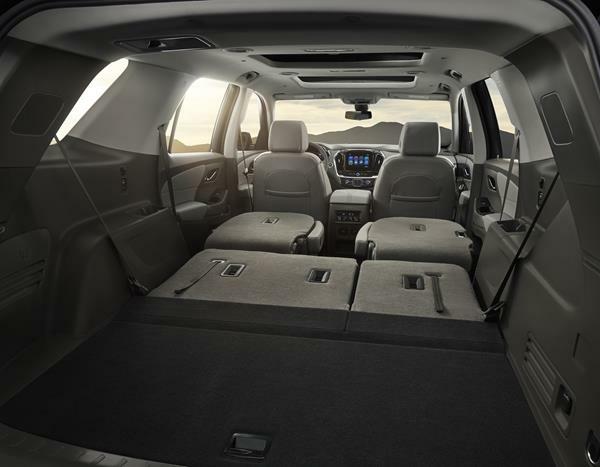 The Traverse with all rows down rivals many minivans for interior cargo usability. Compared to some rivals, the 2018 Traverse doesn’t seem as efficient on paper. In the real world, it’s on par with its competition and better than many, especially given its passenger load capabilities and towing capacity. 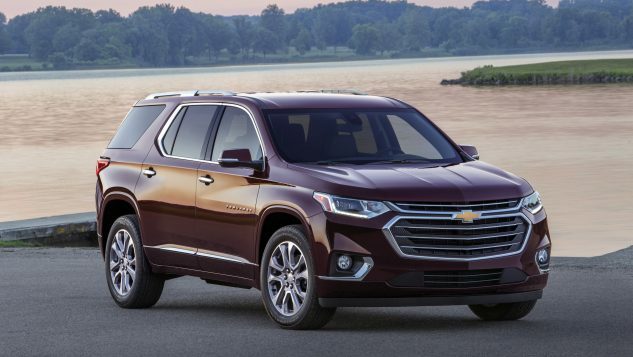 The EPA rates the 2018 Chevrolet Traverse in all-wheel drive at 25 mpg on the highway and 18 mpg in the city. Front-wheel drive models are rated at about a point higher in town and two points higher on the highway. During our week with the crossover, we saw an average of 22 mpg overall in FWD with varied passenger and cargo loads making up the mix. The Traverse RS model and its four-cylinder engine are EPA-rated at 22 mpg combined, with 20 mpg in the city and 26 mpg on the highway. The 2018 Chevy Traverse is powered by a well-vetted 3.6-liter V6 engine that mates to a nine-speed automatic transmission. Front-wheel drive is standard on most trims and all-wheel drive is optional. The engine outputs 310 horsepower, more than enough to make the Traverse feel confident in all situations. 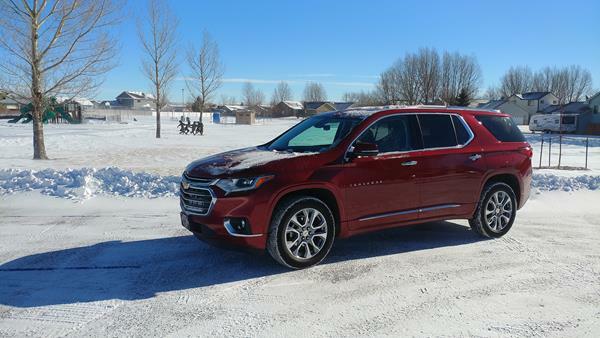 We tested the FWD model in our week with the Traverse and were happily engaged by the engine’s spirited response on the throttle push and strong capability on the road, no matter the weather conditions. 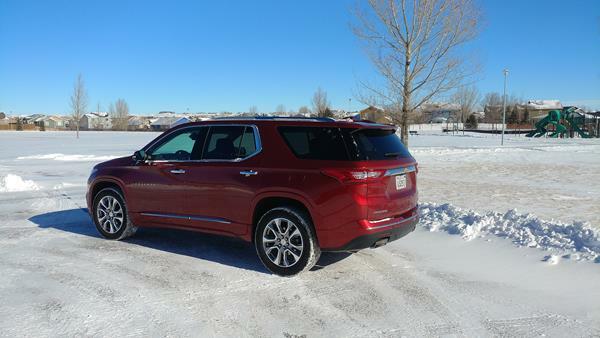 We drove the Traverse in wintry conditions and on warm days with clear roads, and were more than satisfied with its fuel efficiency and response. The 2018 Traverse is not a sport car, but its maneuverability generally belies its size. Visibility is as good as it can be in a vehicle of this girth and length. Suspension and ride quality are very good in the Traverse and a big step up from years past. Steering can be a bit too smooth at times, but only the most engaged drivers will notice. When equipped, the 2018 Traverse is capable of towing up to 5,000 pounds. The 2018 Chevrolet Traverse is competitive with several three-row crossovers in the midsize segment. There is definitely no lack of options for today’s buyers, so cross-comparing is highly recommended. Chief competition for the Traverse comes from the Mazda CX-9, Toyota Highlander and Honda Pilot. The top-selling Ford Explorer is also competitive, though we’d suggest the Ford Flex as a better three-row option. Compared to the CX-9 and Pilot, the Traverse offers more interior ergonomics and better fuel economy for the buck. The Mazda has a great drive quality and a smart look, keeping it competitive, while the Pilot holds the best reputation for reliability in this segment. The Toyota Highlander is as ergonomic for families as the Traverse is. It offers similar levels of refinement and exterior appeal, but will likely be pricier off the lot. Ford’s options are tough sells due to the Explorer having a less family useful interior and the Flex being somewhat polarizing in its exterior appeal. The 2018 Chevrolet Traverse sets a new standard for the midsize three-row segment and definitely brings a lot to the table. We recommend cross-shopping the upper trims of the Traverse with its Buick Enclave cousin, for price matching luxury. In the end, there is no reason for disappointment should the 2018 Traverse be your final purchase choice because this new Traverse is excellent. Read the FULL REVIEW Now to get expert tips on the 2018 Traverse’s exterior, technology, safety, reliability, pricing and more.